On 30 November 2000 the 22D MEU (SOC) embarked aboard the USS Nassau, USS Nashville and USS Portland for a routine six-month deployment to the Mediterranean. As of late 2000 the 24th Marine Expeditionary Unit (MEU) included personnel from the MEU Command Element, Battalion Landing Team 2/8, Marine Medium Helicopter Squadron 266 and MEU Service Support Group 24 - totaling more than 2,000 Marines and Sailors. The 22d MEU's ground combat element (GCE) for the LF6F 1-01 deployment is Battalion Landing Team (BLT) 1/8 (1st Battalion/8th Marines), consisting of an infantry battalion, reinforced by artillery, combat engineers, assault amphibian vehicles, light armored vehicles, main battle tanks, reconnaissance personnel and communicators. Marine Medium Helicopter Squadron-162 (HMM-162), embarked on USS Nassau, is the Aviation Combat Element (ACE) of the 22d MEU and is a composite squadron consisting of heavy, medium, light and attack helicopters and AV-8B "Harrier" fixed-wing aircraft. MEU Service Support Group-22 (MSSG), embarked on USS Trenton, is the combat service support element of the 22d MEU and is structured to provide landings support and supply, maintenance, engineer, military police, medical and dental and motor transport support. During the 1960's and 1970's, the current 22d Marine Expeditionary Unit (MEU) was activated at various times as the 22d Marine Amphibious Unit to participate in exercises and operations in the Caribbean and Mediterranean Seas, and the North Atlantic. On Dec. 15, 1982, it was redesignated the 22d MEU. The 22d MEU and its two sister units, the 24th and 26th MEUs, operate on a rotational basis as Landing Force, U.S. Sixth Fleet, usually in the Mediterranean Sea. While deployed as Landing Force Sixth Fleet (LF6F) 1-83 from February to May 1983, 22d MEU was ordered ashore to serve as the U.S. contingent to the Multinational Force, Lebanon. It conducted several key operations and returned to Camp Lejeune June 26, after completing a short training exercise in Key West, Fla. On Oct. 18, 1983, the MEU left for Beirut as LF6F 1-84. Several days after embarkation, it was diverted for the tropical island of Grenada. Following several days of fighting, the victorious Marines re-embarked and set sail for Lebanon. In Feb. 1984, the MEU redeployed on Naval shipping off the Lebanese coast, except for a small detachment left behind to provide security for the embassy. The MEU was relieved as LF6F on April 9. The next time out, the MEU received many accolades for its outstanding performance during training exercises in Spain, Morocco, Italy, Turkey and Tunisia. On July 3, the MEU reassumed the LF6F commitment and remained deployed as LF6F 2-85 until December 1985. It returned to sea as LF6F 1-87 from Oct. 19, 1987, until Feb. 22, 1988. The MEU also served as the landing force for Phase II of Exercise Solid Shield '87 in Honduras. In 1990, the MEU conducted a non-combatant evacuation operation (NEO) to rescue U.S. and other friendly citizens from war-torn Liberia. It was also the first MEU to conduct a combined exercise in Kuwait during 1991. During its deployment as LF6F 1-93 from Oct. 21, 1992, to April 15, 1993, and LF6F 3-93 from Aug. 12, 1993 to Feb. 4, 1994, the MEU provided a U.S. presence off the coast of the former Yugoslavia as part of Operation Provide Promise/Deny Flight. LF6F 3-93 also participated in exercises Continue Hope/UNISOM II. During its next deployment as LF6F 1-96, Jan. 29-June 24, the Marines of the 22d MEU (SOC) participated in several contingency operations. Operations Assured Response and Quick Response placed the MEU Marines on the African continent where they safely evacuated more than 750 citizens from unstable political situations in Monrovia, Liberia. As LF6F 2-97, the 22d MEU (SOC) again deployed to a host of real-world operations. During Operation Noble Obelisk, the MEU evacuated more than 2,500 individuals from Sierra Leone in a NEO. During Operation Guardian Retrieval in Congo, the MEU stood ready to evacuate persons from the country of Zaire. The third operation the MEU conducted during LF6F 2-97 was Operation Silver Wake in Albania. Along with successfully completing these exercises, the MEU spent almost the entire deployment divided meeting both operational and exercise commitments in Africa, the Mediterranean and the Black Sea. The 22d MEU (SOC)'s next deployment was as LF6F 3-98, July 2-Dec. 7. During this period the MEU participated in exercises such as Matador in Sicily, Cooperative Assembly in Albania, Atlas Hinge in Tunisia, Sea Breeze in Ukraine, Dynamic Mix in Sardinia and Rescue Eagle in Romania. The MEU also conducted an embassy reinforcement in Albania, August through November, due to known terrorist threats. 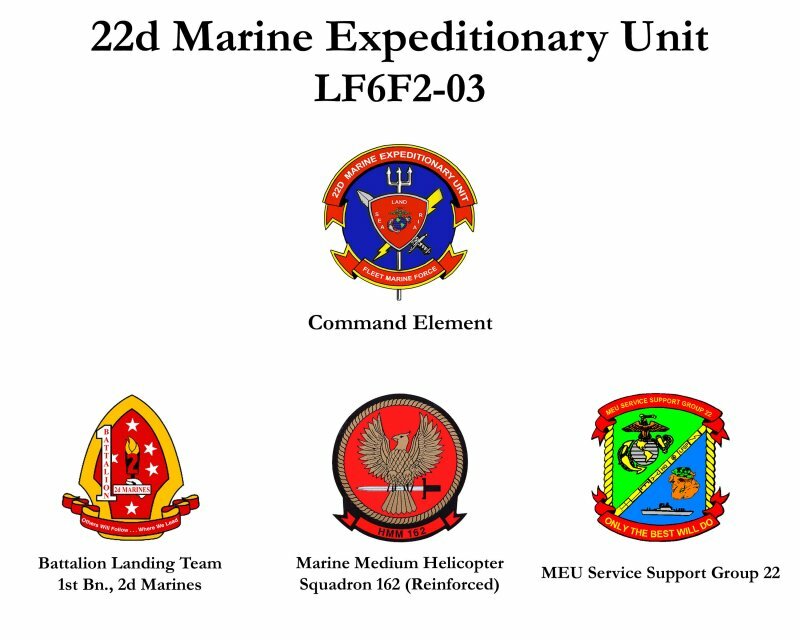 The 22d MEU's Ground Combat Element (GCE) for the LF6F 1-01 deployment was Battalion Landing Team (BLT) 1/8 (1st Battalion/8th Marines), consisting of an infantry battalion, reinforced by artillery, combat engineers, assault amphibian vehicles, light armored vehicles, main battle tanks, reconnaissance personnel and communicators. Its Aviation Combat Element (ACE) for the LF6F 1-01 deployment was Marine Medium Helicopter Squadron-162 (HMM-162). The 22d MEU's Ground Combat Element for the LF6F 2-02 deployment was is Battalion Landing Team (BLT) 2/6 (2nd Battalion/6th Marines). Its Aviation Combat Element for the LF6F 2-02 deployment was Marine Medium Helicopter Squadron-261 (HMM-261). Shortly after the new year 2002, the 22nd MEU was scheduled to conduct its Special Operations Capable Exercise (SOCEX). The exercise lasted from mid-January into early February and give the MEU the opportunity to hone its skills as it prepared for its upcoming LF6F 2-02 deployment. The next deployment of the 22nd Marine Expeditionary Unit (MEU) has, in military parlance, 'shifted to the right.' This change was precipitated by the build-up of U.S. forces in the Persian Gulf poised for military action against Iraq. In Dec. 2002, the 22nd MEU Command Element assumed operational control of its major subordinate elements (MSEs) and began detailed planning for its pre-deployment training which was scheduled to begin in January with an exercise at Fort A.P. Hill, Virginia. However, the stand-up and subsequent deployment of the 2nd Marine Expeditionary Brigade (MEB) in early January stripped 2003 the 22nd MEU of its MSEs (1st Bn., 2nd Marines, Marine Medium Helicopter Squadron 162, and MEU Service Support Group 22). The 22d Marine Expeditionary Unit landed in Northwest Florida for the second portion of its Expeditionary Strike Group Exercise (ESGEX) December 12, 2003 after weeks and planning and coordination on the part of the MEU, Navy, and local and state officials in Florida. For twelve hours Dec. 12, and throughout the next morning, a seemingless endless stream of landing craft deposited Marines and their equipment onto two primary landing sites in Florida's Okaloosa and Walton Counties. The most complicated part of the landing was in Okaloosa County, on the outskirts of the city of Fort Walton Beach, where assault amphibian vehicles from Battalion Landing Team 1st Bn., 6th Marines, the MEU's ground combat element, and Landing Craft Air Cushioned (LCAC) crossed the barrier island of Santa Rosa, sped across an inner coastal waterway and landed on Wynnhaven Beach. The AAVs were the first to land that morning, and LCACs later dropped off Humvees, seven-ton trucks, M1A1 main battle tanks, M9 combat earthmovers, and M88A1 recovery vehicles. Once staged on the beach and ready for transit, the Okaloosa Sheriff's Office blocked traffic on U.S. Highway 98 and the vehicles sprinted across. Highway 98 was blocked three times throughout the day for less than six minutes each time, creating only very minor traffic delays. Further east, LCACs bearing Golf Battery, BLT 1/6's artillery battery, passed under the Mid-Bay Bridge and entered Choctwhatchee Bay with their loads, traveling nearly 17 miles to drop off the battery at Hammock Bay. Again, traffic delays across Highway 20 were kept to a minimum by the Marines' speedy transit across the roadway. Overhead, aircraft from the MEU's aviation combat element, Marine Medium Helicopter Squadron 266 (Reinforced), were a constant presence ferrying Marines and equipment ashore. Once aboard Eglin Air Force Base, the site of the 22d MEU's training, the unit immediately kicked off four days of intensive live fire and maneuver exercises, close air support and surface fire missions, and command and control scenarios. The 22d MEU's arrival in Northwest Florida and its subsequent sustained ground training aboard Eglin AFB is a first both for the Marine Corps and the base, which has historically served as a weapons testing and evaluation site. Following its training aboard Eglin AFB, the 22d MEU retrograded to the amphibious assault ships WASP, WHIDBEY ISLAND, and SHREVEPORT and return to Camp Lejeune. The unit's SOCEX was scheduled for January 2004 and was the final hurdle before the MEU's upcoming deployment. The 22d MEU (SOC) deployed aboard the amphibious assault ships WASP, WHIDBEY ISLAND, and SHREVEPORT as part of Expeditionary Strike Group 2. In addition to its Command Element, the MEU consists of Battalion Landing Team 1st Bn., 6th Marines, Marine Medium Helicopter Squadron 266 (Reinforced), and MEU Service Support Group 22. The 6,300 Sailors and Marines in the USS Wasp (LHD 1) Expeditionary Strike Group (ESG) 2 depart 17 February 2004, making their maiden deployment as an ESG in support of the global war on terrorism. The MEU headed to Afghanistan for a spring military operation, amidst speculation that the Marines and sailors might be diverted to help out with civil unrest in Haiti. As of 26 February 2004 the unit's general location was about two-thirds of the way across the Atlantic Ocean bound for the Mediterranean Sea. By mid-April 2004 the Marines of the 22nd Marine Expeditionary Unit (Special Operations Capable) had completed their movement into Afghanistan to assist the country in its quest for long-term stability. Prior to its deployment to Afghanistan, the unit completed a amphibious landing exercise in Albania and conducted simultaneous Mediterranean port visits in Malta, Albania, and Croatia. Advance elements of the MEU first arrived in Kandahar in mid to late March to lay the groundwork for the rest of the force's arrival. After a brief period of reconsolidation, acclimatization, and refresher training, the forces of the 22d MEU (SOC) began conducting combat and civil military operations. The MEU's specific missions in Afghanistan will include facilitating election efforts and seeking out and destroying Al Qaeda, Taliban, and anti-coalition militia operating in the unit's area of operations. The unit will be in Afghanistan for an undetermined length of time operating under the operational control of Combined Joint Task Force 180.